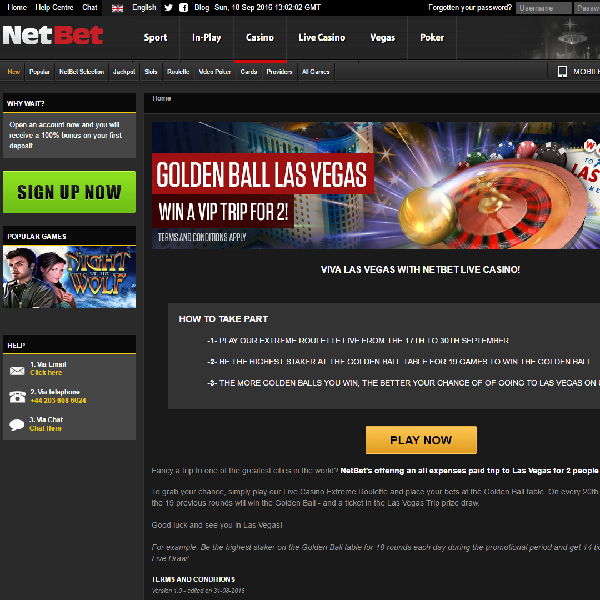 NetBet Casino is giving members the chance to win a VIP trip for two to Las Vegas in its Golden Balls promotion. All you have to do is play the Extreme Roulette Live game between now and the end of the month and if you place the highest bets at the Golden Ball table for 19 games you will win a golden ball. The more golden balls you win the better your chances of going to Las Vegas. The prize draw will be taking place at the end of the month and the winner announced soon after. The prize includes flights to Las Vegas, five days in a luxury hotel, a helicopter ride of Las Vegas as well as a limousine trip, £1,000 spending money and more. Don’t miss out on this great opportunity, head over to NetBet Casino and start playing today.